Put chocolate chips, butter, cream, and salt in a medium sized, microwave safe bowl. Cover and microwave on half power for 30 seconds. Remove and stir to melt the chips. If the chips do not melt while stirring, return to microwave and heat for another 15 seconds on half power. Once everything is melted and mixed together, add the vanilla and lemon zest and mix until combined. Cover and place in fridge until the candy is hard enough to shape (about two to three hours). Remove from fridge, and using a teaspoon, divide the candy into at least 16 portions. TIP: We find these to be quite rich so we try to keep them on the smaller size. Roll each of the portions into a ball and then roll in the coconut. If they get too soft to work, return them to the fridge for a few minutes. TIP: To make these more spring-like, we tinted the coconut a pastel yellow. To tint coconut, place it in a bag or sealable container with a few drops of food colouring. Shake or stir until well coated. Cover and leave overnight. TIP: These could also be rolled in icing sugar, cocoa, or sprinkles. Return to fridge to harden and to store for up to a week. These are best served cold because they soften as they warm to room temperature. They still taste just as good, but they can be a bit messy – especially for little hands. 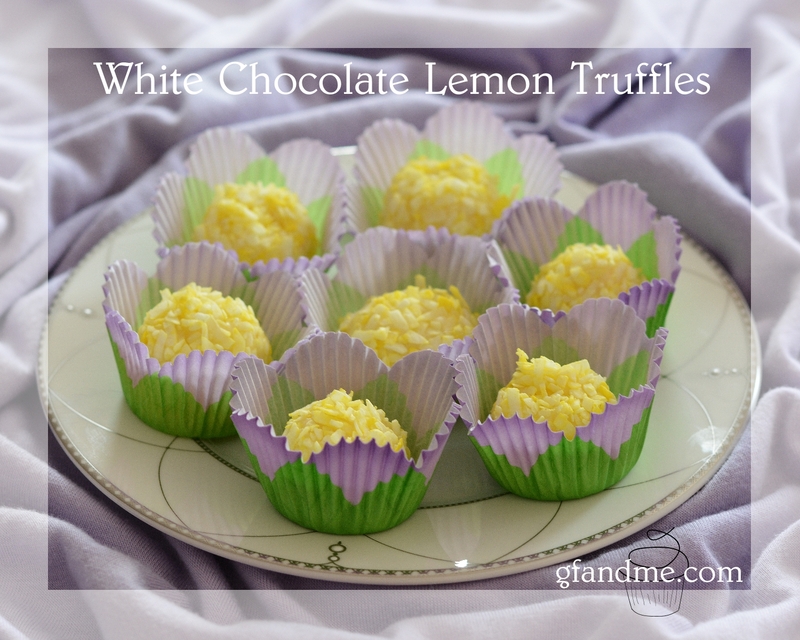 This entry was posted in Baking, Drinks & Desserts, Recipes and tagged candy, gluten free, holiday, no bake, no flour. Bookmark the permalink. Thanks for the reblog – and for working so hard to do it! I recently moved gfandme to gfandme.com and have been having some issues after the transfer. Can you tell me how you received the truffle post? Did it show up in your reader? I have been having trouble with the wordpress reader since I moved as well. Thanks! They’re fun to make too!